Today I have an incentive card to share with you. I made this card and filled it with the new in color ribbon for my downline members who reached a particular level in sales for the month of June. 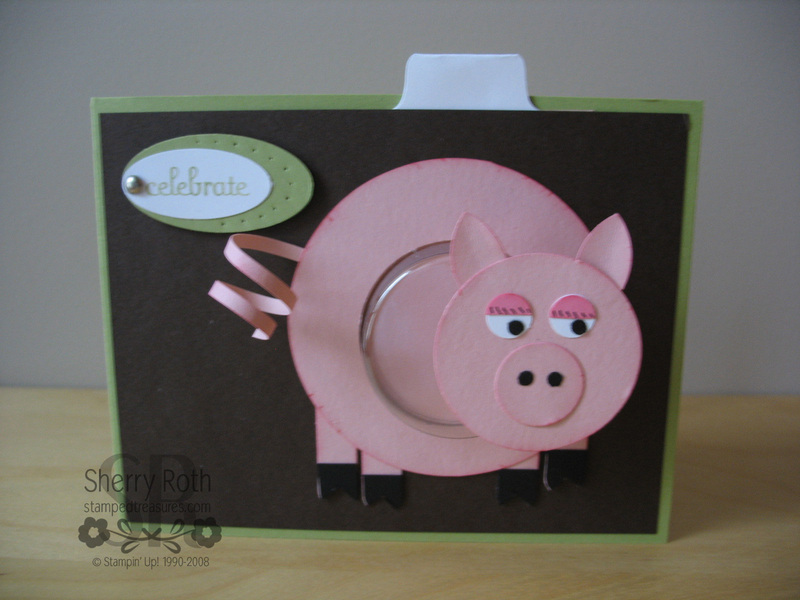 The pig was created using a variety of punches - isn't he cute?! Here's a list of punches used for this cute little critter. I love using these little sweet treat cups (116802) and it's fun to come up with different ways to use them. Janet Wakeland, a wonderful demonstrator from the states, shared with us 100 different ways to use these little cups. Incredible! 9. Office supplies - Rubber bands, paper clips, etc. 24. Tools – nuts, bolts, small nails, etc. 46. Ketchup/Mustard packets – voila..
47. Tickets to a game/play/museum, etc. 50. “Poops” REINDEER, SNOWMAN, ETC. 62. Replace o in words – YOU, LOVE, MOM, POP, etc. 63. Fit inside loop of B, P, etc. 64. Photo ornament – scallop circles, cording, etc. 67. Use in center of punch shape animals – turkey body, pig body, puppy body, etc. 76. Create Removable /slide for project so items can be easily removed w/o ruining card/page/tag etc. 80. Sports – mini footballs, soccer balls, baseballs, etc. 83. Lots of Bots – nuts/bolts/screws, etc. 85. Use as Ball – make inside look soccer, basketball, etc. 88.Diamonds, diamonds, diamonds – perfect place for a ring! 100. Use with Sweet Centers (116521), Sweetheart (CM 120780/WM 120415) and Something Sweet (CM 118589/WM 117688) stamp sets! Thanks for stopping by - I hope I've inspired you to use our Sweet Treat Cups! Click here to order your Sweet Treat Cups and coordinating stamp sets!